In tenkara, a fairly esoteric group of anglers subscribe to the “one fly” approach where they strictly fish only one specific pattern (or slight variations of the same pattern). A larger group adheres to the more liberal “any fly” approach, meaning that they don’t necessarily restrict themselves to one particular pattern, but feel that any fly they pull out of their box at random will work. Both philosophies seem to be founded on the same principle: the fly matters far less than what you do with it. Or, in other words, a skilled fly angler can make just about any fly work in just about any situation. I’ve tried both the “one fly” and “any fly” approaches and they both worked for me (though I’m not really interested in committing to either philosophy). Yet, it did get me thinking. All the “one” whatever discussion always seems to focus on the fly. But what about rods, lines, and other gear? It would seem to me that if one of the great things about tenkara is that it pushes the angler to do more with less, why has only the fly been singled out? Shouldn’t (or couldn’t) the same minimalistic philosophy be extended to all gear? I’ll admit that I’m probably not going to reproduce this faithfully but I recall an anecdote where someone gave the great fly fishing legend Lefty Kreigh a cheap, Walmart-quality fly rod setup. He proceeded to cast the line into the backing with just a couple of double hauls and then handed it off to someone saying something to the effect of, “here, now take this piece of s**t away from me”. The point being that with enough skill, the tools almost become irrelevant. With skill, you can adapt to any situation. And perhaps the very things that seem to limit us actually make our sport more challenging and interesting. I think that’s one of the appeals of tenkara for many anglers. The gear didn’t catch the fish–we did. So, why do we spend so much time agonizing over rod action, line diameter, and all the other minutia? I love to try out new gear and compare and experiment with new designs. I think it’s part of the fun. But if I subscribe to an “any fly” approach because it tests my skill and makes me a better angler, why am I not doing that with my other gear? We all have our preferences when it comes to rod action or lines. For me, it mostly comes down to feel. Let’s face it, there are a ton of “good” tenkara rods out there today. And I’ve cast a lot of them. If you blindfolded me and handed me three or four similar ones to cast, I probably couldn’t tell you which ones were which. There are a few though that stand out. You can not only blindfold me, but also wrap duct tape around my eyes and ears and I’d still be able to tell you when I’m holding an Oni rod or a Tenkara USA Ito in my hands. The actions of those two rods are truly unmistakable. But most other rods on the market (in their respective lengths and actions) are so similar that I have a hard time even describing the differences between them other than ergonomics or aesthetics. That’s not to say they’re bad–just similar. Right now, I’m staring at a basket of tenkara rods that are all really, really good. They’re well designed and well finished and you can get them for a very reasonable price. I’ve fished all of them and I can’t think of a situation in which in which I couldn’t get any one of them to work. I could probably pick any one at random and catch fish (in fact, I have). I’ve never been on the stream and said, “oh, I’d be catching more fish if only I had brought XXXX rod”. But they each have their own personalities and I definitely like how some feel better than others. Sometimes, I choose to bring a particular rod with me because I just feel like fishing that action that day–not because I think it will help me catch more fish. I wonder if this is the real reason we favor one rod over another. Sure, there are some technical restraints to what certain rods or lines can do versus others but I think those are fairly limited and a savvy angler could easily overcome them. There is only one time I can recall where I thought the line actually made a significant difference. I was fishing in Rocky Mountain National Park and it was so windy, that I just couldn’t get my #4.5 level fluorocarbon line to turn over. I switched to a titanium tenkara line and was finally able to slice through the wind. I probably could have found a way to make the level line work (maybe with a blow-line presentation) but it just felt better to be able to make a real cast through the gales. I’ve got a pile of unmarked spools that store lines of which I’ve long forgotten the length and diameter. But on countless occasions, I’ve just grabbed one or two in haste, fished them, and also caught fish. Were they #3 or #4? I have no idea. And I wasn’t about to pull out the micrometer to figure it out. I made it work somehow and that’s good enough for me. While ideally, I like to think about where I’m fishing and dial in the correct rod and line size, it never really seems to matter as much as I think it will (like the fly). So with a raft of “good” rods and lines out there, I’m wondering if anyone out there takes an “any rod” or “any line” approach just as they employ the “any fly” approach. It doesn’t seem so far off from the spirit of tenkara. I’ve got my favorite tenkara rods but could also make a piece of s**t work if I wanted or had to. Given the choice though, I think I’ll take my Oni rod along. What about you? Do you think rod choice & line make a difference? I think for me, all rods are somewhat different, if only because I buy unique rods. I don’t have a blog where people send me baskets full of rods to test, and I am I grad school, so if I buy a rod, it needs to be something that will fulfill a single unique need. I have an ito my first rod, a daiwa 43 for saltwater, an ayu ii I bough on sale, which is a generally heavy rod, and a tenkara times 5:5 rod. The closest to an overlap I have is the ito and the tenkara times rod, but those are worlds apart. There is certainly nothing wrong with your way of fishing, and I wish I could pick up every rod out there to fish. If you can’t, then it is really easy for every rod you have ever fished to be unique. All of that being said, unless I am hitting the salt, I am not too choosy what rod or line I bring with me to go fishing on a day trip. I will usually bring one big fish rod and one softer rod, but I would never imaging confusing two of them. I have the same problem Jason does. Buckets full of rods. Some of them are for field testing/evaluation sent to us by manufacturers or retailers but most are rods I have paid full retail for. Our guide operation fishes a huge variety of river/stream types and conditions so I group my rods by water type, headstream, tenkara stream, mainstream, large rivers, carp. Within those groups, somedays I just randomly grab a rod from the pile and other days I choose a rod based on a specific characteristic or feature I want to play with that day or high winds or other environmental conditions I may favor one particular rod over another. I like having some variety and playing with cool toys but in reality I could probably get rid of the giant pile and narrow it down to one rod for each type of stream/river system I fish. But what’s the fun in that? Great article! I would love to be in the “any” category. Unfortunately, I don’t fit in either category. Many times I DO feel like its the rods fault, or line/fly’s fault, or even the water clarity or flow for not being able to catch fish. But the bottom line is my lack of skill. I would love to be able to try many different rods, lines, and flies to find my perfect combination, but that is not financially feasible for me. Just like tools and the other fishing gear I have, including Western and conventional, I only buy each with a specific purpose. I’ve long since eliminated as much overlap as possible in most things I own anymore and think hard about what a new tool’s use would be before buying it. I also don’t believe in the any random fly will do scenario. Instead I try to tie a broad spectrum of flies in different patterns, sizes, and colors and try to make take a logical approach in choosing one – it’s certainly not random. Same goes for saltwater lures, each has a particular purpose or function depending on experience of selection. Tenkara lines on the other hand are still new to me and I still love to experiment with different ones and that’s not the case with me on Western lines since they’re so expensive to “experiment” with. 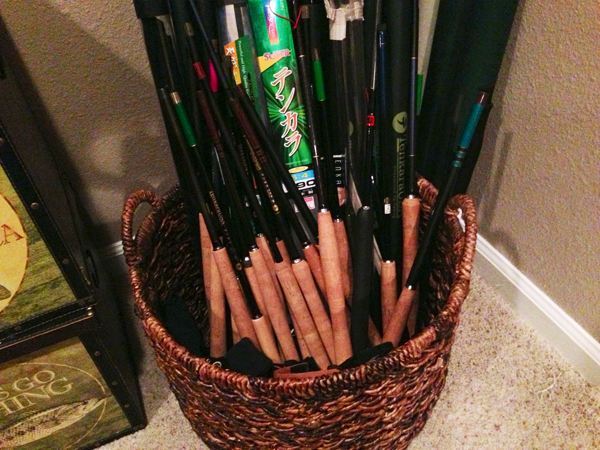 If I had as many rods to choose from as is in that basket, it would be difficult to keep them all straight. I like the as little gear as possible approach and make your selections wisely. If you feel that way, it is because nearly all the rods in your basket are mid-market rods made in China for new companies that have no more than a few months of experience in rod design (and that includes all the first generation Tenkara USA rods). Of course they’re the same. There are some very nice – and very unique – rods out there made by companies that have been in the business for decades. Other than your Nissin Pro Square I don’t see one in your basket and don’t remember reading your reviews of any Shimano, Daiwa, Gamakatsu, or Sakura rods. I know you don’t like any rods that don’t have cork grips, so I know you’ve never reviewed any of the Suntech rods – but they are like nothing you’ve ever fished. I cannot disagree with your assessment that a skilled angler can make any of the rods work, but our days on the stream are limited and it makes sense to use specialized tools in situations where one clearly works better than another. Have you ever met a carpenter who had only one saw, a mechanic who had only one wrench or a golfer who had only one club? I subscribe to the minimalist approach, but, that’s because I simply can’t afford to not be minimalist. My only rod is a TUSA Ayu. I’ve had one spool of level line for over a year. I keep the same line attached to my rod all the time, and when I want to lengthen or shorten it I just add or cut line. As far as fly choice, right now, I don’t use traditional Tenkara flies. I’m not very good at tying yet, and I’m not going to pay the high price of online Tenkara flies. I go to my local fly shop and buy the 89 cent flies, usually caddis, but I like to have a few nymphs, hoppers, and rusty spinners available too. I love fishing Tenkara, and someday I may have a couple more rods to choose from, but, in reality, I catch plenty of fish as is. Oh, and most importantly, I enjoy myself. I really found commonality with this topic Jason. Although I don’t consider myself a “one anything” sportsman, I’m of the “make do” school just because I dislike complicating things with lots of gear. That’s a major reason why I started using tenkara. I am constantly trying to leave things behind. I spent this last spring season with just one favorite rod, a half dozen very different flies patterns, tippet and a pair of forceps. Oh, and a tube of floatant too, I love dry fly fishing. If it wouldn’t go into a pocket it stayed behind. I fished streams, kayaked ponds and lakes. I used that one rod for everything from Ishigaki’s and elk caddis for trout to panfish and bass poppers. Adjusting line length I cast and dapped it, and shallow-trolled streamer flies behind a tiny dodger with it. It was not designed for many of the situations that I found myself in, but I caught lots of fish, didn’t break it and enjoyed myself immensely. In the final analysis, I don’t think it mattered what rod I had chosen, because the challenge of being creative with limited tools made each successful catch all the sweeter because it wasn’t always easy, and I wasn’t encumbered by lots of stuff. I felt like a stealthy fishing ninja, LOL. I am not sure how important it is to limit yourself to one of anything but I do know there is a mistake of sorts made when you make things too complicated. When you spend all of your time worrying over the minutia of is this the best line, with the best rod, with the best fly you begin to second guess and never do settle on anything. As new options present themselves you are tempted to follow. I am still using the basic set up. I have 2 rods that I bounce back and forth on more or less. I use the standard furled lines. I do strictly use Kebari flies and I am trying to find my “one pattern” that I will use. As a creative person I guess this is where I get lost. I enjoy tying flies and playing with patterns and materials. I did very recently send a good chunk of my materials off to a friend’s kid in Oregon who is taking up fly tying. I have limited my materials as such and through simplifying I am honing in on a single pattern. I do feel that my fly designs are kind of a part of me. A personal expression? They are something that my mind worked out and that I am extending into the water for the fish. I get great satisfaction when that connection is made. I want to get one thing down before I expand to level lines and too many different rods. the reason I came to Tenkara is because of the dropping away of complexity that western fly fishing was for me. 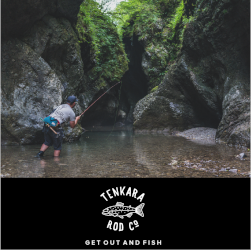 I find with Tenkara a kind of self expression and art that connects and becomes less about the gear and more about the experience. Hi Chris, I agree that it’s important to use the right tool for the right job. And I certainly do not take an “any rod/any line” approach. All I’m saying is that one could and wondered if anyone out there did. As for the rods you mentioned, you’re right. I haven’t tried any of them. I’m really interested in Shimano rods (especially the ZE). The problem is they tend to be pricey to buy for testing. I can buy 3 or 4 mid-range tenkara rods for the price of one high-end Shimano or Daiwa rod. I’m not saying that they’re not worth it–just that I don’t have the money to buy a lot of those rods. I would love to get my hands on some of those rods though. One day. Thats easy to answer… I always strive to use the CORRECT ONE… Each will be based upon a variety of variables such as environment, fish size and behavior, season, weather, etc. Yes, I do feel that the rod makes a difference. In fact, I’ll go one step further. I think that the right rod with the right line definitely make the difference. What difference? The difference between fishing and catching fish, and fishing, catching fish and enjoying the whole experience — not having to fight the rod, line, or combo there of. The rods I prefer make the whole experience effortless and really enjoyable. I did not appreciate this until I had fished many rods and began to see the differences between them. I fish with one spinning rod — a hand me down, i don’t even know what it is — and an echo solo 5 wt 4 piece fly rod with the reel and line it came with. I rarely use the spinning rod. When I fly fish, I use 3 flies 95% of the time. Elk hair caddis, woolly buggers, and scuds. I fish for everything from shiners to great lakes salmon with those three patterns. I have the anglers in my circle, whom I like to fish together and who are my best rod testers and critics. Believe me, all of them provide ABOLUTELY DIFFERENT “ONE” favorite rod/line combinations. Tenkara casting technique is always very individual and depends on anglers personal biomotorics as well as fishing conditions. You need some experience and some attempts to find your personally ONE rod/line. I could get it done with just one rod for trout, probably a 6:4 360cm tenkara rod or a 9′ medium fast 4wt rod, but it wouldn’t be ideal fishing for me. I’m somewhat of a chameleon when it comes to fly casting. I can cast them all, whether it be long, short, soft, stiff whatever is in my hands. I’m also ambidextrous so both hands work nearly as equal. I also think, similar to Tom, that matching a rod to the environment makes a big difference in onstream performance and success, so I always choose at minimum two rods to take with me wherever I fish. I often only fish one but like to have a back up and an option. Jason my bucket looks similar to yours with many options to choose from. It does get expensive though, and I can’t actually say I recommend it for most people. I think most people owe it to themselves to own at least two tenkara rods if chosen wisely. But I feel one all rounder will work just not ideally in all applications. I have purposely tried to make my rod selection cover as many different ranges and fishing conditions by their respective lengths, power ratings, and their differing rod action types as possible. So, no, my rods are not all the same or necessarily even similar. Seiryu Rods: 2, a Suntech, Kurnai HM 33 and a Nissin SP 390, for 11′ and 12′ 11″ long respectively, and a 6:4 and a 5:5 action types. Rod Weights: 1.1 and 1.5 ounces respectively. 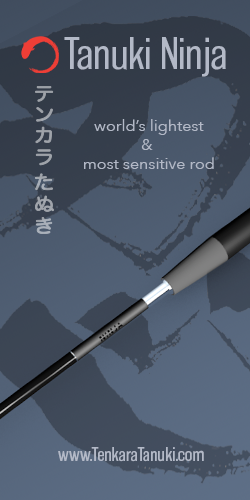 Tenkara Rods: 2, a TUSA 12′ Iwana and 13.5′ long Amago rods, both are rated as 6:4 rods. These are my least used rods at present. Rod Weights: 2.7 and 3.5 ounces respectively. Keiryu Rods: 3, a 7′ 10″ Kiyotaki 24, a 9′ Diawa Soykaze 27 SR, and a 12′ 7″ or 14′ 1″ Daiwa 43 MF Zoom rod, 7:3 or so in action types. Weights: 1.0, 1.6 and 3.0 ounces respectively. T-Lines Used: In addition to mountain stream fishing , I also do a lot of warm and cold water stillwater fixed line fly fishing, so I cast floating fly line style adapted level and tapered T-lines on stillwaters, as well as level and tapered Mono Fluorocarbon T-lines on running waters, and furled FC tapered T-lines of my own construction on both lakes and streams at times. Fly Patterns Used: I do not adhere to the One Fly Concept at all as I would find it to be personally boring. Not because I doubt that it will work but because I already know that just about any fly pattern will catch some non-selective feeding fish pretty well in most cases on both lakes and streams. I fish with dry flies on running waters exclusively, and on still waters I also catch a lot of my fish on dry flies. Not because I am a dry fly fishing snob but because I find dry flies to be highly effective a lot if not most of the time. On stillwaters I am quite happy to fish with nymphs and wet flies when they prove to be most effective. I often change fly patterns on every 10th fish, so I have proven many times over to my satisfaction that your presentation is far more important than what fly pattern you happen to choose to use. This is what I do, but it is your fishing and I believe that you should fish in what ever way brings you the most pleasure and enjoyment. Thanks for the comments everyone! I suspected most people fished different rods in different situations and this confirms it. It poses an interesting question though: did our tenkara ancestors do the same? That is, did commercial fishermen 200 years ago have different rods for different situations? Or did they typically fish the same water over and over again and one rod was sufficient. I know very little about tenkara history so would be curious if anyone has any insight into this. I introduced my good friend Lance to Tenkara. He has been fishing since he could walk and has always used the cheapest western gear he could afford. He really can cast anything, after a few test casts he just unconsciously switches up his casting stroke. The first time I handed him a Tenkara rod he started making beautiful pin point presentations within seconds and now his go to rods for pocket water are Tenkara-ish rods. He’s a good enough caster to be able to make the unconscious changes to his casting stroke on the fly. So I definitely think it is possible to develop the skill of casting any rod, any line and any fly. You just have to fish a lot and with whatever is on hand. I’m very far off from that level, but if I fish enough maybe I’ll get there. Jason Klass and Lance are working on a different level than the rest of us. For now, I overcompensate for lack of skill with cool new gear. almost the same the answer is yes. to diverse habitats and feeding behavior. It would be very nice (and economic) to have a do-it-all rod/line/fly. But for me at least that is not possible. Jason, I suspect that the Japanese commercial fishermen you spoke of had very little opportunity to fish many different streams and environments since their primary means of transportation was their own two feet, and the mountainous terrain in Japan was isolating and difficult to get around in at that time. And since they probably made their own fishing equipment as well (locally grown bamboo rods and horse hair lines come to mind), they would not have had access to all the gear we can so easily get today. For sure fishing back then and there things would have been much more simple, equipment wise, than they are for the most basic of Tenkara fly fisherman we have today. I have noticed you seem to have a fondness for rods in the 13 foot length range, and you like to fish with a #4 sized line (probably to better handle the wind) most of the time, and you like to fish down stream primarily, twitching the wet flies that you prefer to use to catch your fish. So your rod choices are probably made with those fishing methods well in mind. And using those methods probably works better while fishing on fairly good sized streams, which is reflected in your rod choices as well. If you always fish the same size waters, of course all your similar sized rods, lines, and flies are going to feel the same or very similar. Try fishing tight, brushy streams with dry flies, fishing up stream. Fish some streams that you can literally step over. Then fish some high mountain lakes where it is really windy. I am sure that you will need different feeling rods, lines, and different flies to handle those different fishing environments adequately. It is not so much that the rods are all the same. But when you use the same criteria to choose the rods that you fish with all the time, it becomes almost impossible to get different rod fishing results using the same rod picking criteria. No doubt that over time the gear for fishing tenkara has gone through many obvious changes. The people have evolved into a more complex modern civilization and many if not most everyday things have been modernized. The one thing that hasn’t changed is nature. The rivers are still rivers, the streams are still streams and the creeks are still creeks. The trees and bushes are still growing next to the water and people still gravitate toward it. 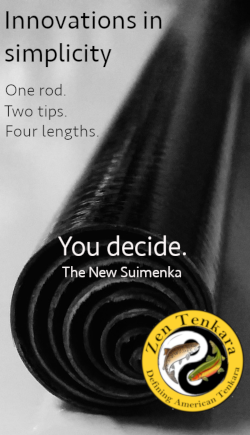 It only makes sense to me that if you want to be a successful tenkara fisherman, then and now, that you would have at least two rods, one longer and one shorter. It’s common for me to be fishing up a river and find a promising tributary or two or three in the same day, that feed the river and are not suitable for the longer 13′ rod that I’ve been fishing the mainstream with. This is the main reason that I own and carry more than one rod. There are reasons why there are tenkara rods in different lengths and actions. I realize these reasons and I’m sure that they realized them as well. As we know, “the magic is in the magician, not the wand.” In the three years or so I have been fishing exclusively tenkara I have used the 12′ Iwana, the only tenkara rod I own. So far, I have not found a situation where I wished I had another rod, although I can imagine a small stream crowded with trees where a shorter rod might be an advantage. There’s a great video on YouTube where a fellow is fishing the San Juan with a stick and a flyline and outfishing the guys with the $1,000 Orvis gear. I would agree with you if your only goal while on a stream is to catch fish then any Tenakara rod you lay your hands on will help you achieve that goal if you are a reasonably good angler. However, catching fish is the bonus that occurs when I spend time outside fishing, hiking and taking pictures. So the rod, the line, my pack, my camera, my boots, etc. etc. aid in the enjoyment of these pursuits. I fished today with a buddy and he had a long TenkaraUSA rod (can’t remember which model) he wanted me to try out. So I committed to fishing this for a couple of hours to really get a feel for it. I caught fish, plenty of them in fact but, fishing this rod was pretty miserable to me. Nothing wrong with the rod per say, good flex, good casting but, it was very tip heavy and after a few hours this rod became a chore to cast and handle. Some may really dig the that rod and the way it feels in their hand but, it really was not a fit for my body, casting style and fishing style. So gear matters. Just like boots for instance, you could fish in flip flops and it wouldn’t matter to the fish but, your broken, bloody and sore feet after a long day on a small stream may feel differently. The one fly technique works because trout are hungry and with some skill we can present it in a way that negates and finickiness they may have. However, anglers are much more discerning in what we put our energy (money) into and therefore gear matters. How much you spend does not but, finding your fit does. 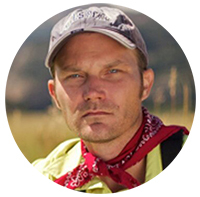 I appreciate you posing the questions Jason and it does make me think about what works for me in a rod and what I am looking for. If I am going to spend my money I want that rod to fit me like a solid pair of boots, correctly and specifically to my body. Well put Jesse. I agree 100% that the feel of the rod plays into the enjoyment on stream. Sometimes I take a certain rod just because I feel like fishing that particular action that day. So much for the touted “simplicity” of tenkara. Gearheads exist in our sport too, of course. Guess I’m just not parsing this whole “rod action” thing finely enough. A recent post from a known tenkara angler and guide here in the states mentioned something that helps to debunk the whole simplicity theory. “A Rod a Line and a Fly” may not be as prevalent as we’ve been led to believe. He mentioned that while fishing with several tenkara anglers from Japan he was surprised at how often they would change their lines while on the water. I am assuming that he meant going back and forth from long to short and light to heavy lines. In the past it has also been mentioned that the Japanese brought along multiple rods to fish the local waters in America. Some of them also furl their own lines tailored to fit a particular rod and also change their formulas with each length for their particular rods. I fished yesterday with a rod w/reel attached to form a single unit, one line, one leader (still pretty much a single unit), one spool of tippet and one box of flies from which I used just two of them only because one of them got chewed up. Sure I have the addition of a reel but I also have the absence of multiple lines. Wow, I thought Tenkara was supposed to be simple? I’ve onlt been fishing Tenkara since January of this year. I started with a used tenkara USA, IWANA. And have since purchsed 2 additional rods, a Badger Tenkara 13′ Classic and a Badger Tenkara zoom, Bad Axe. Now I’ve been flyfishing since 1957 and own 22 western fly rods and 35 reels, ranging from a 7′ 1wt to a 16′ 12wt spey rod. I also have literally thousands of flies. I havent picked up a western rod all year. With Tenkara for me the legnth of the rod and the type and legnth of line are the most important things. There are timesthat I want a floating line and times that I want a furled line and times, a level line, so in a norman stiuation I take 2 rods, one long and one short and several lines. I am currently down to 2 boxes of flies, one of “tenkara” flies and oneof dey flies. I have found that I catch many more fish with Tenkara thanI ever caught with western rods ( Ive kept fishing logs for 55 of my 58 years of fly fishing). I find that I no longer change flies as often as I use. I hsve also found that 9 and a half foot Tenkara rod can “bow and arrow” cast under the lowest of canopies on creeks I could never have fished western style. Growing up on bamboo I like the 6:4 ratio rods. 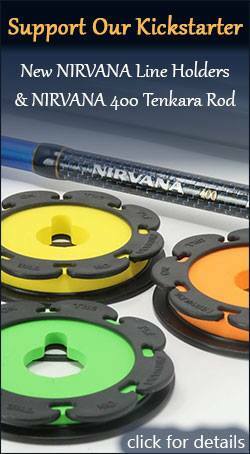 Will I purchase adfitional Tenkara rods? Well yes, probably, do I need more than the 3 I already have…nope. Zoan, yes, I think 2 rods (one shorter and one longer) can cover most situations for trout. A 3rd, stouter rod might be a good addition if you want to go after bigger fish. Glad you’re enjoying tenkara! Another thought provoking post! Perhaps the single most important attribute of a rod is that the angler enjoys fishing it. I’m sure that if I had a couple grand to spend on Japanese models, I could buy a raft load of rods to test and find the “perfect crisp medium” action that I’d prefer to fish. In the meantime, I am having a blast and catching tons of fish with the “crisp enough medium” actions I fish that are made by an American company that is still learning the ropes. Does this make me less of a Tenkara angler, or somehow rob me of fun and learning that I could be having? I certainly don’t think so. And the fish I am catching don’t seem to care either. On that note, does anybody remember the “BREAK THIS ROD” contest that an American company ran for fun last year, where they sold a horrible, ugly, and even SMELLY rod for cheap and then asked the anglers to catch the biggest fish they could with it? People had a BLAST with those rods! They still talk about them fondly. Many fish were caught on those beastly rods, some them quite large, and word was one even stood up to some good sized carp for a while. The point of all this is that gear (be it rod, line, or fly) serves to support the angler experience but is not the whole sum of it. Attempting to shoehorn Tenkara into a certain purist approach to equipment choice is fine if that is a personal decision on style and experience, but pretty silly if one tries to apply it to the way others are fishing. The rod and line an angler uses make a difference to the quality of their own experience on the water, and that is the only relevant metric worth measuring them against. A beautiful life is all about experiences! We have a different culture here. In Japan, Japanese only have a knife in their kitchens. American kitchen, knife gets its own world. 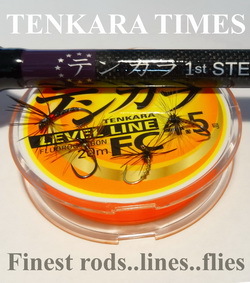 It is just like Tenkara fly vs western flies… The one vs many is all about the culture and social pressure.